This is a guest post from Abraham Immanuel, a dear friend of ours, who has helped us redesign the mobile experience for Geeks with Juniors. Abraham is a web developer/designer who loves to browse beautiful sites across the web, play his guitar, and play games on his iPhone. I have just gotten into a new romantic relationship a few weeks ago. Unfortunately, I also had to leave town for some work-related stuff and found it a bit frustrating that my girlfriend and I’s communication channel would be limited to texting. Thankfully, Eric recommended us to try Avocado. Share hugs, kisses, photos and even to-do lists with your loved ones. Avocado is a cloud-based application that enables you to keep connected with the most important person in your life everywhere you go. Using their mobile apps, you can maintain a good communication with your most important person. Even though Avocado suggests you to call each other as "boo", you can use this app with your other family members too. Co-founded by two ex-Google employees, Chris Wetherell and Jenna Bilotta, Avocado enables you to stay connected with your boo virtually and privately. Avocado is available on the iPhone, Android and the web, allowing you stay in touch everywhere you are. Avocado allows you to send messages as well as share your face expressions, to-do lists, photos and memorable moments with your boo. Unless you want to send videos, I believe Avocado can almost replace the roles of iMessage in our private one-on-one communication. Having custom items such as pre-defined photos of your face expressions and to-do lists really makes Avocado a perfect centralized solution for typical communication needs of a couple. To start using the app, both of you need to purchase the app and sign up for new accounts using your e-mail addresses. Then, one of you needs to invite the other by his/her e-mail address and define a password that will be shared among you. Once your boo has accepted the invitation, you can start using all the features like uploading a profile picture, setting your anniversary date and other personalized in-app settings. After you have successfully set up everything, you will have access to four tabs, i.e. timeline, to-do list, photo gallery, and settings. The timeline in Avocado works like a typical one-on-one chat window, whereas the to-do list tab shows a list of tasks to complete between the two of you. The photo gallery shows a grid view of all the photos that both of you have uploaded via the app. You can tap on a photo to view it in full size and read the caption that you wrote when you uploaded the photo. Avocado has a fairly reliable push notification system and a set of 10 unique sound effects. 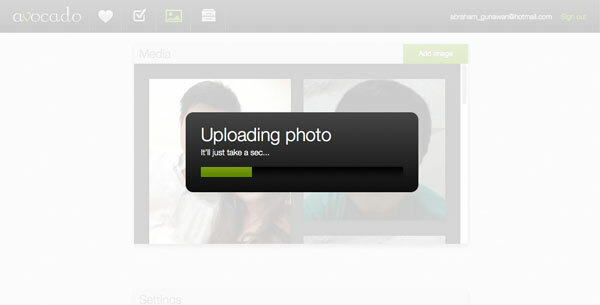 You will get a push notification each time your boo sends a message, updates a to-do list and uploads a photo. These unique sound effects help to differentiate Avocado's push notifications from the others. Hold your phone to your chest to send a hug. Touch the face of your boo and plant animated kisses. In addition to the iPhone app, you can use the Avocado web client to share photos. I do not have an Android phone, but I frequently browse the web from my Mac. The web client for Avocado really helps to push the boundaries of what I could do with the app. In addition to having the same access to data and features as the iPhone app, the web client allows me to easily upload photos from my Mac. Everything between the iPhone app and the web client syncs smoothly. Even the custom shortcuts that I have defined on my iPhone can be accessed from the web client. Each time I write LOL, :), OMG or other typical chat abbreviations, the custom face expressions that I have pre-defined on my iPhone will show up on the web client, too. As a web developer, I am excited to see that Avocado has a public API for developers. I haven't really tried anything with the API yet, but taking a quick look at the list convinces me that it is a comprehensive set of features. If you use Chrome as your browser, you can try Cilantro, a Chrome extension that allows you to quickly post and share links with your boo without opening a new tab or leaving a site you are currently visiting. 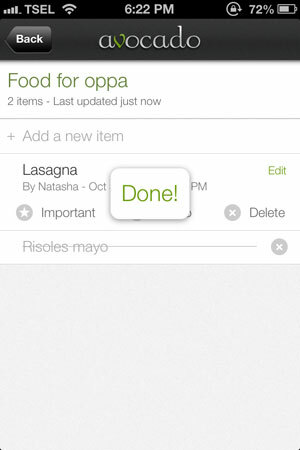 The app allows couples to share to-do lists and attach photos to each item. This helps a lot when the men go grocery shopping, for example. In addition to the messaging system that I use almost all the time, I really like the to-do list features that Avocado offers. Not only can I share the to-do list with my boo, I can also attach a photo to each item on the list to make sure that she knows exactly what I meant by the item name and description. We use the to-do lists to manage errands that we need to run, things that we need to accomplish, events that we need to attend together and even ideas for our next dates. Avocado also offers a unique feature called quick notes. In the chat window, you can tap and hold the text field, then swipe it up to open a list of pre-defined snippets of commonly-sent messages. You can edit the contents of these quick notes at any time, which is really a huge time-saver, especially when you're on the go. Finally, I really enjoy the bookmarklet called Avocado This. Similar to other popular social networking bookmarklets, it allows you to send images and links to your chat and to-do lists. Not only does it save time, itthe also allows me to easily send important information (references and tidbits) to my boo when she desperately needs help researching while she is on the go. Quick notes keep shortcuts of commonly sent notes to save you time when sending messages while on the go. Avocado is beautiful application with a well-designed and seamless user experience across multiple platforms. If you are a couple that wants to try a new app that can help you stay connected with one another, I highly recommend you to get Avocado. I hope more developers would be interested in developing extensions and other cool apps using the public API that the Avocado developers have offered. This would allow Avocado users to leverage their data and use cases. To receive daily updates of app reviews, please subscribe to our RSS feeds, follow us on Twitter, or like us on Facebook.